This course thoroughly educates the foundation processes of teaching a canine to utilize the mouth/eye coordination in efforts of proper targeting, gripping, and capturing the simulated prey. It focuses on both puppies and young green animals, offering the tools, methodology, scheduling, and drive markers. Our scientists, teaching impressive techniques, have developed this course and changes that make the canine brain thoroughly grasp the training by targeting symbiosis and antibiosis. Tracking imprintation is an ancient concept and practice, which our scientists have structured to create a long-long term potentiation (LLTP) of tracking memory, primarily by concentration on the principles of dopamine release and reuptake, through a masterfully mapped out track training regimen and procedures. The student will be capable of demonstrating the full complement of procedures and methodology of the model. Utilizing the same LLTP neurobiology methods as CANI 176, this class teaches students a multiple based methodology to formulate a very strong basis for canine imprintation of narcotic odorant gases. The class centers the training for both primary alerts (aggressive and passive), instructing both methods and techniques of modifying alerts and to form to the individual canine’s memory change and behavioral perspective. Similar to CANI 177, the explosives imprintation and development course targets the methodology of memory pathways, as changes occur within the canine’s perspectives of both visual stimulation, olfactory triggers, and amygdalae processes; all coming together, carefully orchestrated by the trainer, focusing on the passive alert balance and lock and hold as a physical response. This course is a survey of competitive canine events. The program covers structured competitions for: sport and working dogs, conformation, and agility. The course surveys competition groups. 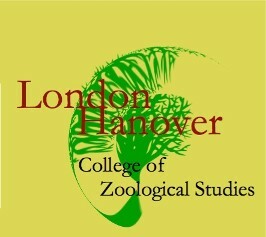 The course also encourages the student to investigate the anthrozoological and evolutionary effects of the competitions. This program covers the fundamental aspects and movements of instruction and methodology for teaching a canine the leader-follower components of behavior. It focuses on obedience training as a task oriented training but furthers the training into relationship concepts for daily actions. This class provides the necessary education and practical operations of instructing and performing canine agility. The course involves: safety, course construction, motivation and action, canine muscle usage and warm-up cool-down, online and offline procedures, training, competition, and real life encounters for a canine. This is a course centered on the fundamentals and practices of elementary and medial development of canines for usage of services: law enforcement, therapy, assistance, etc. The course is based heavily on behaviorism and neuroscience of learning, limbic and autonomic nervous system. A strong support of dual texts and video supplementation offers the student the visual guides to the theory with a focus on troubleshooting. The knowledge of Canid pack theory is helpful but not required. This course is an A and B segmented curriculum. Course A is centered on the primary, theoretical fundamentals of law enforcement - narcotics K9 training science and practices. The curriculum utilizes a two-text development and video instruction, for student understanding and competence, in both recognition of methods and applicable sciences. The course utilizes mammalian behaviorism techniques and chemistry of narcotic gas expression. Course B is a lab practical involving the development of a canine for the purpose of detection of narcotics. Both segments are 7-week courses. Courses may be taken individually, simultaneous, or in sequence. This course builds upon the techniques, strategies, and methodology of CANI 175. This course develops the equipment process changes and the concept of prey and defensive drive markers utilized for timing changes and long term memory for the canine. The course teaches the student the specific training options for developing the canine grip and coordination at a higher level: independent, autonomic response. The course also introduces the student to the nociceptive stimulus concepts and the methods for avoiding and repairing the long-term memory of those nociceptive actions. This course builds upon CANI 176. The class focuses upon the speed changes, visual stimulus usages, and environmental manipulation, designing them for the steady increase of the canine long-term memory pathways. It covers changes, as they connect the visual and olfactory pathways to the tracking memory, allowing the handler to gauge the muscle response, based upon the methodology as it fits the canine behavior. This course builds upon CANI 177. This course introduces the student to the concepts of environmental memory, as it relates to odor detection and alerting. The course covers exterior vehicle introduction, building exposures, and the institution of search patterns and air movement changes, regarding the location of the odorant. The course focuses strongly on the methods used to prevent future location and alert issues. This course builds upon CANI 178. The course focuses on the cache of required odors; introducing each one to the canine in a carefully planned odor-match sequence. The introduction to vehicle searches and building exposure is also a core of the class. Students will learn the techniques of increasing a quicker search response, alert, and conformation hold. This course covers the basic and intermediate aspects of human remains detection. The course introduces the human decomposition stages and the introduction methods for the canine to the odorants involved in those stages. The student is exposed to the aspects of alert development and canine instruction for search strategies. This is course is based on scientific method recording. The class teaches the student the scientific method for research documentation and applies it to the recording methods for canine training. The method assures that training is recorded in a format that far exceeds legal standards and accepted as science standards. This course will replace all generic record software and forms, creating instead a truly scientific method, to match the science of canine training. This course is an A and B segmented curriculum. Course A is focused on the theoretical and biological sciences of training a canine for tracking human scent. Course B targets the lab operations of training and developing a canine for the purpose of tracking human scent. The CANI 247 curriculum utilizes human biology, biochemistry and environmental chemistry concepts, along with behaviorism controlled-stimulus/controlled-extinction. Students are educated in both the training practices of canine tracking, as well as, the practical purpose of working a tracking canine for the purpose of locating human scent. This course is designed to teach the student the techniques and methods of completing the narcotic training for the dog that has been imprinted. The course instructs the student how to conduct training advancement, problem solving, as well as, live search techniques for increased operative success. This course instructs the student in the methods of shifting a properly imprinted canine to levels of multiple decoy operations and frequent drive flips. The student will understand the techniques for transitioning to new equipment, introducing multiple engagement areas, and reading transition behavior of drives. This course builds upon Canine Tracking Methodology I. This course instructs the student in the primary method styles of tracking, involving both speed tracking, as well as, methodical slow tracking techniques. The course, teaches an introduction to road crossings and hard surface tracking. Students learn the precise methods and uses for increasing distances, time, and canine focus. The course places a strong teaching focus on the value methods of training and reward concepts. This course is designed to specifically map and instruct on the biological truths of the Bloodhound breed, the tracking ability, and training of the breed. The course teaches students the myths of the Bloodhound and balances it with the strengths of the breed. Students learn the methods of developing the tracking response per the memory and value of the canine; in addition, the course formulates the training necessity with the careful planning and techniques for tracking. This course covers the fundamental considerations for training and handling a canine for accelerant detection. The course covers the required odors, concentration methods, alert training, search methods, and basic handling techniques. This class teaches the student the basic fundamentals of explosives detection, training, and basic problem solving skills. The student will be capable of understanding the concepts of handling a passive alert canine, working explosives scent, types of search styles required for proper detection, equipment, common explosives identification, general canine behavior, safety, and legal aspects. This course is designed for students who are seeking navigation, mountaineering, and essential required education for testing capability and operational certification for search and rescue. The course is not designed as a canine class but rather a human qualification and operation technique. 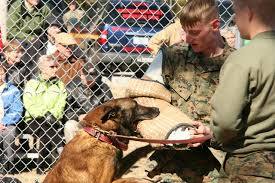 However, canine operations are integrated into the course as applicable. Students completing the class are typically well prepared for qualification practical. This course is often taken along with CANI 277. This course is a canine-based training. The course teaches the methods of scouting, air scenting on command, find/re-find, distance finds, off and on lead searches, and the training techniques to develop all of the listed topics. This course teaches the student the methods and strategies for training a canine for human scent detection, location sourcing, indication, and recovery apprehension for criminal apprehension inside building structures. The course teaches safety, liability, and handling methodology for the human: and search training methods, drive control, decoy response, and alert training for the canine. This program instructs the student in the primary 20, problem solving, behavioral issues, that plague the general public and their canine pets. The student learns the behavioral aspects of the problems, techniques for modification, and the changes of the human side of the equation. This course instructs students in the fundamental and advanced techniques for teaching a canine to utilize drive and aggression for a bite suit. The class focuses on safety of the decoy and canine, types of equipment, purpose and usages for the training, as well as, decoy methods and environments. The course breaks down the procedures of training for adjustment and transfer of the different positions on the suit. This course follows Canine Tracking Methodology II. Students will learn the advanced techniques of urban tracking starts, multiple scent tracks, split tracks, backtracks, on and off track evidentiary design and detection, as well as, specific processing techniques of different styles and approaches, i.e., ABC, Stoplight, multistage, clock system, stages of rest, etc. This class follows Canine Intermediate Development for Narcotics. Instruction includes: training the canine for high searches, introducing newer narcotic odors, warehouse detection, dog distractions, food proofing, and re-searches, following delays: The course places emphasis on the habituation of canine training: causes and effects of that training and methods to offset complacency. This class follows the Canine Intermediate Development for Explosives. This class teaches the student how to advanced the canine training to facilitate and master public transportation, multivariable levels, aircraft, airports and gate checks, human scent scans and problems associate with human scent offset. The course focuses on problem solving advanced situations: live searches, alert failures, agility, and distractions. The program also instructs point-to-point methodology. This course follows the Reading and Managing Canine Aggression Course. But may be taken independently. The course substantially covers multiple aggression signals and instructs the student to the most plausible methods and techniques for modification of that aggression. In order to assure success, this class requires a prerequisite of Tracking I. This course teaches the fundamental and medial methods of training and utilizing a canine for bite apprehension. The program covers the equipment usages; training methods, drive selections, decoy training, and safety. This class utilizes multiple media guides to offer multiple views of concepts. This course focuses on the training for scent detection, processing methodology, and restarts for all urban environments. The course concentrates on surfaces, buildings, distractions, and residential areas: particular focus is made on the encounter with human distraction for both the handler and canine. In order to have full success, this class requires the prerequisite Tracking I. This class builds upon the tracking structure of fundamental tracking. It takes the principals of fundamental tracking and manipulates the structure, training plan, and reward structure into a successful capability of training asphalt. The class covers scent behavior on hard surfaces, track laying, speed, approach, In order to assure success, this class requires a prerequisite of Tracking I. This program is designed to teach the trainer how to utilize specific techniques in efforts of working all rural environments, increasing the canine dedication to the scent, scent discrimination, and processing lost scent. The class covers training techniques for rural advance, scheduling and planning, handler and decoy tracks, distance increase techniques, terrain changing, and distraction and canine handling techniques. This course follows Canine Training Detection I. The course teaches the handler the specific strategies for interior vehicle searches, as well as introducing the concepts of interdiction and probable cause alert. The student understands the advancement techniques for building searches and another level of drive reward and alert building. This course follows Canine Development for Human Remains Detection I. The student will learn the advanced techniques of HRD: understanding the methods for live searches, advancing the search capabilities of the canine, depth increases, as well as, age considerations of odorant sample. The course places an emphasis on water searches and boat operations, working with dive teams, and scent recovery. Advanced obedience is a course designed to teach trainers the techniques and methods of creating a training plan for canine ability advancement. Unlike basic obedience, advanced obedience relies on a strong focus of communication and off lead, relationship communication: hand signals, body language, etc. This course follows Accelerant Detection I. The course develops the alert to a further capability for live training scenarios. Exposure to charred sources is integrated. Search methodology is advanced and fire scene safety is incorporated. The course also concentrates on problem solving and laboratory confirmation. This class is suited for students who have completed canine explosives Methodology I. Methodology II is designed to educate students in multiple areas of detection: explosives detection problem solving, logistical search patterns and methods, introduction to explosives chemical gas expression, and speed adjustment methods. The student will be capable of formulating training plans for problem solving of most areas of explosives detection, be capable of mapping a precise search method of buildings and structures utilizing maps and blueprints, understand the concepts of explosives gas behavior and where to best position a dog for detection, and how to modify and adjust team speed during an explosives search. The student will also be capable of having the canine produce a clear point to point off lead search. 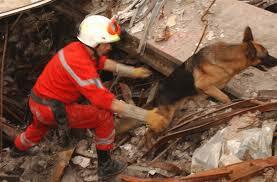 This course follows canine search and rescue training I. The course instructs students in the technical aspects of scent, as it relates to the swells and declines of human victim emotion. The course also teaches the advanced techniques of problem solving for search and rescue topics, including: refusal on re-find, distractions, and canine time procedures for environments. This course is highly recommended for any international students seeking to achieve an American Society of Canine Trainers SAR IV certification. This course teaches the tactics for handling a working canine under stressful conditions of criminal apprehension. The course teaches the student the safety measures while tracking or operating, in building environments, and urban settings to read canine actions for signals of danger. The course teaches various techniques and acronyms assigned to stay safe and alive. This course instructs students in the training and handling methods for disaster recovery; rubble searches, structure collapses, ground collapses, etc. The course focuses on off lead directional fundamentals and training, communication, bark alerts, scent detection positions, scent behaviors of the environment, distractions, and safety. This course stays true to the requirements of the national search and rescue disaster K9 testing standards for both the United States and the United Kingdom. This class teaches the student techniques of decoy involvement in canine bite training. The course clearly displays and breaks down the physical and mental aspects of advanced decoy training. The course covers: multi dog operation, equipment slides, utilization of environment for increased stability of training, realistic scenarios, gunfire operations for decoys, etc. The course covers a multi areas focus of police K9 training problem solving situations. The program offers solid assistance techniques and operations usages for modifying and retraining a canine for troublesome situations. The course offers a broad spectrum of topics, all carefully explained and demonstrated. This course teaches the fundamental selection process, imprintation, and development of dogs for assistance of humans with disabilities or special needs. An exciting field for trainers, assistance training is often elusive for techniques and information. This course offers techniques across the multiple fields, surveys the needs and generalization of those fields, and presents training strategies and plans. This class presents the student with the necessary education of training a canine and implementing handling styles in the area of patrol. The class focuses on officer safety and survival, approaches, crown control, officer protection, bail out equipment, window exits, felony stop canine function and actions, building search approaches, search advancement, weapon apprehension, multiple suspect apprehensions, etc. The student learns the techniques as trainer and handler, as well as teaching styles of the topics. This course focuses the students education on conducting narcotic detection searches, both vehicle and houses, under dark conditions that may present: no lighting, limited lighting, or full artificial lighting. The focus on canine performance under environmental stress is a major topic of the course, as is the handler motion and control. This course stands alone or is often taken along with Canine Unit Survival for Armed Encounters. This class explores the safety practices for both night tracking, as well as, urban tracking. A strong emphasis on safety of canine and handler is present. The course strongly covers the precise techniques for training and handling the canine under situations of darkness, urban, distractions, and safety stress on both the canine and the handler. The methodology breaks down a selective method for the environmental conditions that are present. This course educates the student on the training techniques, handling styles and search methodology of narcotic (or explosives) detection in the environment of highway stress and specifically for large motor carrier, tractor-trailer vehicles. This course teaches the student the methods and tools for training a canine for narcotic trafficking detection per interstate and highway interdiction means. The course instructs trainers and handler in the proper techniques for training the canine alerts and reward consequences. Topic include: Alert builds, interdiction time gas exigency, narcotic time decay and gas behavior, cash seizures for narcotic odor detection, door handle vs. seams, approach and strategy for partnership sweeps, court testimony attacks. This course follows the Patrol Tactics course. Teaching the very specific training methods, problem solving, and handler/team integration for canine usages in tactical (SWAT, SPECOps) situations; the class guides the student through the imprintation and conversion of patrol to the technical search and precise control of armed suspect, tactical environments. This class institutes the technical aspects of environment, scent, and weather into the equation of tracking. The course teaches trainers how the effect of the topics affects the training and success of tracking scent and availability of a canine. Topics include: Vegetation, wind, moisture, temperature, slopes and angles of environment, pavement. Chemistry principles taught are: Entropy, Fluid Mechanics, Surface Tension, Capillary action, Gas laws and Rheology. This course follows Assistance Canine Development I. The program teaches students the specific methodology of training canines for individual fields of assistance. Whereas the level I course branched the survey, this course narrows the field to the most common needs, instructs the principles, and teaches the student the necessities of training the owner. This course follows Canine problem solving I. This class builds upon the level I course by both increasing the level of difficulty of the problem, narrowing the focus to primary functions: tracking, apprehension, odor detection, alerts, handler aggression, etc. The course introduces multi option problem reducers, offering several resources and options for each particular problem, in efforts to successfully change the trouble spot without creating another problem area. The advanced explosives methods class is designed for students who have completed canine explosives methodology II. This class educates the student in utilizing the canine in high-risk environments and concentration searches on public transportation, rail systems, and power grids. The class focuses on the detection K9 team’s capability of working with other teams and detection equipment. The student will be capable of demonstrating off lead searches from distances, mapping buildings and structures for proper search strategy without assistance of blue prints, demonstrating the proper search of multiple aircraft, and understand the methods of training to reach these goals. Students may credit up to 6 credit hours for internship experience. The university and the department must approve the internship. Internship specifics have variable options but all require 7-week minimums per 3 credit hours. This class follows canine problem solving II. In this course, the student will learn the techniques of solving problems in canine training from the perspective of an observer. The course is designed to assist the student with learning the methods and instruction for problem solving a situation by instructing the handler to carryout the function, as opposed to the trainer having to handle the canine. The class focuses not only on the techniques for the problem solving method but also the specific needs of blending the handler and canine together to assure success. The class offers a concentration on the trainer recognizing the handler involvement in the problem creations and subsequently the success. This course follows Canine Problem Solving III. This course is an encyclopedic concentration on significant canine behavior problems. The student is reviewed in the fundamental and intermediate levels of problem solving, followed by instructed teachings for combined methods, reflected problem solving avoidance, and how to instruct others in the behavior modification. This course teaches the advanced methods of training a canine for the leadership role of protection and apprehension. The methods instructed are carefully managed, as a singular portion of a large conglomerate of behavioral triggers from the canine, decoy, and handler. This course utilizes real life scenarios and examples in the formation of training plans and methods of instruction that concentrate the student on the ability of greatly assuring control, accuracy, and confident capability in all patrol situations or protection modes (for private usage). The primary focus is on realistic environments and strategic planning. A graduate level course, this course requires a prerequisite of Advanced Canine Assistance II. This course concentrates on the selection, imprintation, development, and techniques for training a canine to assist owners with severe, hearing difficulty or complete loss. The course focuses on both the training methods for specific, required need and the education of the owner. A graduate level course, this course requires a prerequisite of Advanced Canine Assistance II. This course focuses on the training for dogs in assistance for humans who are blind or severely limited in vision. One of the most difficult fields of all canine training, assistance for sight impaired requires a careful intelligence, dedication, and capability of lifestyle which provides the adequacy for successful development of a canine for this field. This class teaches students the required training plan, strategies, and models for properly training the alerts, shifts, movements, etc. The areas of training are implemented in week one. The focus is placed on the trainer methods of instructing the owner, handling education. This course follows CANI 500. This course assists the student with a required behavioral composition; instituted and drawn by the student, as a portfolio of canine problem solving, learned techniques, skills, methods, tactics, tools, and flexibility of combinations, all centered around the concepts of timing and value memory. As a significant part of the composition, the student will be assisted in the inclusion of handler instruction and behavioral modification, as related to the problem solving.